There have been tons of revelations about the National Security Agency since Edward Snowden began leaking documents in June. So many, in fact, that it's kind of hard to keep track of all the important stuff we've learned. 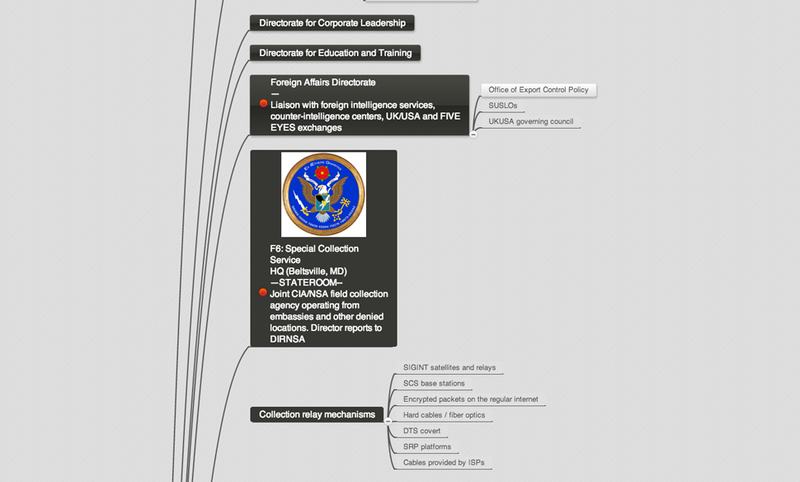 And piecing together a picture of the NSA's hierarchy and mechanics seems almost impossible. But Marc Ambinder, a contributor at GQ, The Atlantic and The Week, is on it. He's been mapping the internals of the agency based on leaked documents, reporting from major outlets and his own research. Using his chart, you can follow the standard procedure when an analyst identifies a target, queries code named databases and then contributes new data as she compiles information on the target.